In 2000 I bought my first vintage motorcycle. 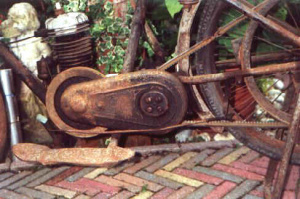 De Motobécane was complete, but in terrible state. The challenge lay in the restoration. And so we did. Some parts had to be replaced while others only needed a good cleaning and polishing. Because the process of restoring often happens in the winter, the rebuilding of the Motobécane happened in our living room. Nice and comfortable with heating. Before the assembling of the parts could take place, the frame, front fork, the mud guards, gas tank, stand and luggage rack had to be sandblasted, primed and painted. After being painted the stipes and transfers were added and repainted with clear coat. But first, the gas tank was put into a concrete mixer to clean out the inner side of the gas tank (put some coarse sand or nails and screws in the tank before putting it into the concrete mixer and let it turn for several hours). After that the gas tank was washed with benzine and rinsed with water and dried. Finally the coating was applied so to be sure that it was completely petrol resistant. The foot pegs, model wagon, have been duplicated on a CNC machine by an oldtimer buff. An other problem was the rear rim. It was broken while the spokes were being tightened. It had to be replaced. fortunately my dad was already well known to the oldtimer scene so he knew that there was one to be found in Norg. 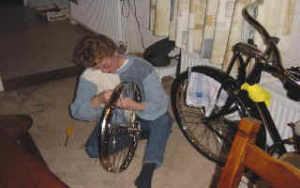 However, I had to drill the holes for the spokes myself and the ones for the little spokes which hold the belt drive pulley. 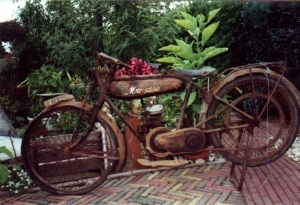 After approximately one year the Motobécane was ready to go on the road. 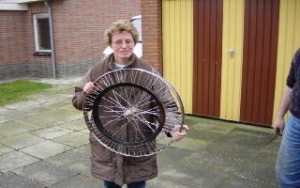 Just collected the rim from the bicycle repair shop where the spokes were tensioned. The drive pulley is already mounted.